Finnish broadcaster (YLE) have announced when their national final will be held. The final takes place at The Helsinki Metro Arena. Can YLE use UMK to select a winner this year, to go on to win Eurovision next May in Ukraine. It has been announced that the UMK final will take place on Saturday 28th January. This will be the sixth edition of the Finnish selection show, as it started in 2012. In this edition of UMK, the public and jury will equally get a 50% vote to decide who represents Finland at the 2017 Eurovision Song Contest in Ukraine. Details on where to submit an entry can be found on the official UMK web site. Finland first took part in Eurovision in 1961. Lalia Kinnunen was their first ever entrant with her song Vaola ikkinassa. Laila placed 10th with a total of 10 points. 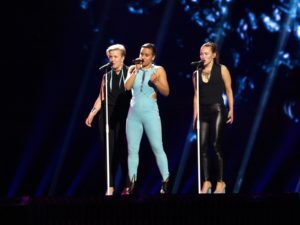 Their first nil-point; came 3 years later, courtesy of Laila Halme, with her song Muistojeni Laulu. Finland have won the contest once, when Lordi sang Hard Rock Hallelujah in 2006. On the negative side, Finland have come last 9 times, and they failed to qualify to the grand final in 2016 with Sing it Away by Sandhja. Watch Sandhja’s semi final 1 performance of Sing it Away below.